On the opening day of the 19th World Festival of Youth and Students which takes place this year in Russia TPU Rector Petr Chubik met University volunteers in Sochi. 23 TPU volunteers work at the festival. The festival was opened on October 14 with a carnival parade in Moscow. Russia hosts over 10,000 international participants from 150 countries. The main program of the festival will be held until 22 October 2017 in Sochi. Five thousand volunteers from across Russia work at the festival. 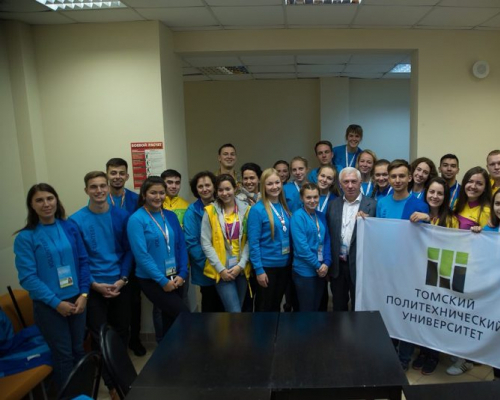 Tomsk Region is represented by a delegation of 50 volunteers. TPU Rector Petr Chubik met them on 14 October. Students told the Rector where they are engaged. The rector, in his turn, wished them to have a good time, to communicate with the best international youth representatives and to remember this amazing event for their whole life. Tomsk Region delegation gives assistance in venue and meeting organization, guest accompanying, media work provision, transport logistics. Besides, the delegation will participate in the closing ceremony of the 19th World Festival of Youth and Students. In different cities of Russian 20 Volunteer Training Centers had been established to select and train new volunteers. In March 2017 TPU opened own Volunteer Training Center which presented one of two centers in Siberia. Training was organized at the TPU International Cultural Center. Volunteers took part in the orientation and competence training. During discussions and other interactive activities they learnt and developed skills necessary for successful participation in the festival: effective communications, conflict management, time management, responsibility, intercultural communication and teamwork.